"Look who's back home! 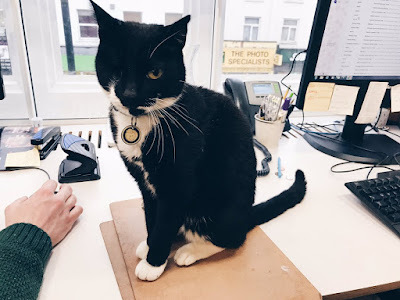 It's only bloody Bush (Theatre) cat Pirate back from the dead! Rejoice!" 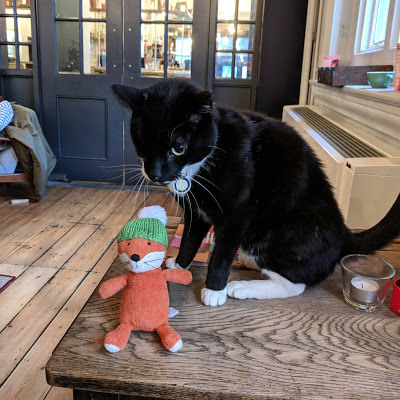 In that vein, it was particularly distressing to have learned during the early days of January that Pirate, one of the resident felines at the Bush Theatre at 7 Uxbridge Road in the Shepherd's Bush section of West London, eight kilometers west of Charing Cross, had disappeared without so much as a trace. "I'm lost. Please help find me," he announced via Twitter on January 15th. "Look out for the black and white cat with one eye in Shepherd's Bush. I am very small and wearing a Battersea Dogs and Cats Home collar." Other than facilitating the sending out of that tweet, it is not known what, if any, additional measures staffers undertook in order to locate him. Normally, fly-posting the neighborhood with Lost Cat posters, door-to-door canvassing, and the alerting of local rescue groups and veterinarians are the usual emergency initiatives that are improvised under such trying circumstances. More than six months were dutifully crossed off the calendar without there being either any sightings of Pirate or additional updates on his situation posted to his Twitter account. At that juncture, it certainly looked like the world had seen and heard the last of him. Then like a coup du ciel there came a startling announcement. "It's official. I'm back at the Bush after a shortish break from the world of theatre in Ealing," Pirate announced June 29th on Twitter. "Thanks for breaking the news." It has not been disclosed either who found him or how that he ultimately was returned to the Bush Theatre. All that is known is that he apparently had been staying at some sort of a school in Ealing, seven kilometers west of the theatre via the A4020. Unless he was stolen and transported there in a cage, it is nothing short of a miracle that he was not run down and killed by a motorist given that Shepherd's Bush is such a congested neighborhood. Also, since he was wearing one of Battersea's collars, it is utterly disgraceful that no one at the school saw fit to return him to his rightful owners. The details have not been spelled out on social media but, presumably, it was from the data contained on his collar that his rescuers learned who he was and thus were able to effectuate his return to the theatre. On the other hand, even if his collar had been removed his notoriety in West London is such that it alone may have been sufficient in order to have facilitated his eventual return home. 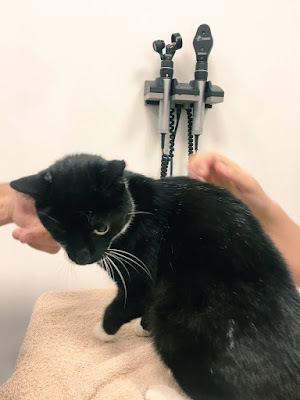 Other than having lost some weight, Pirate was deemed by staffers at the theatre to be no worse for the wear and that assessment was soon vouched for by a visit to the Royal Veterinary College in Camden, ten kilometers northeast of the theatre. "Many thanks to Jose and Emma from (the) Royal Veterinary College and Battersea for looking after me at my heart scan today," he tweeted on August 22nd. "It seems my ticker never has been better." His psychological well-being, however, turned out to have been a horse of an altogether different color. "Once we took him back to the theatre it took him a few weeks to get accustomed again, but he's all settled in now and seems to be happy," a spokeswoman for the theatre confided in a September 14th e-mail letter. With a population of forty-thousand souls and hopelessly clogged with vehicular traffic, Shepherd's Bush is far too perilous a neighborhood for cats not on a leash and that admonition goes doubly for one who has only one eye. Yet, staffers at the theatre do not appear to have profited any from Pirate's latest misadventure. "He does have a tendency to escape from time to time, but hopefully he won't try it again anytime soon," was all that the theatre's spokeswoman had to say on that topic in her letter. 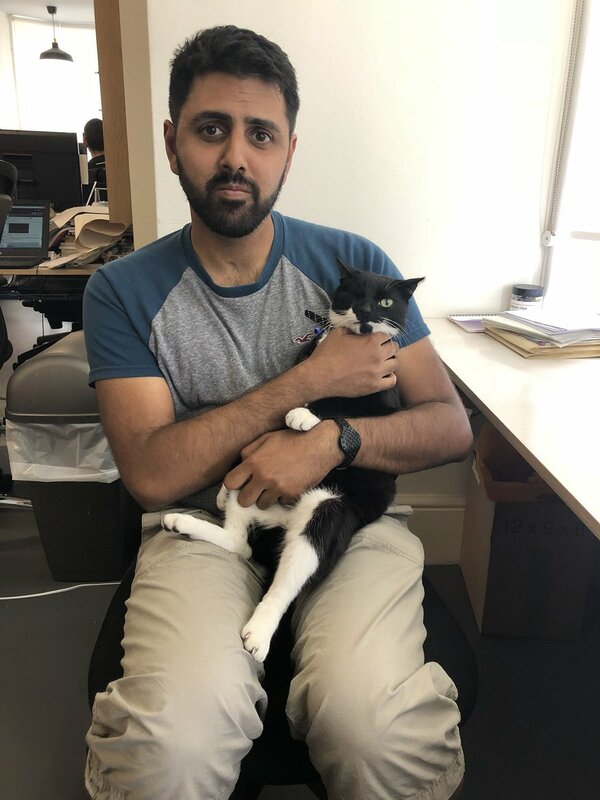 Hope, however, is not going to save Pirate's fragile life; au contraire, only responsible and enlightened guardianship on the part of Patel, a cat fancier himself, and other staffers is ever going to suffice in that regard. That nonchalant response is all the more deplorable considering that this was by no means the first time that they had come precariously close to losing him for good. For example, he went missing earlier on May 3, 2014 and was gone for four days. "Pirate has just returned home with his tail between his legs (accompanied by the absolute heroes who found him! )," Battersea Dogs and Cats Home announced May 7, 2014 on its Facebook page. "Thank you all for sharing. We are so touched by all your kind thoughts." The Bush Theatre's difficulties in holding on to and safeguarding the lives of its resident felines are by no means limited to Pirate but rather they extend to a jet-black tom named Marley. "Please help my humans find me," he pleaded April 3, 2017 on his Twitter account. "I've gone walkies." Luckily for him, he soon was located. "We found Marley," the theatre announced a day later on his Twitter account. "He is very hungry but seems fine from his adventure." For his part, Marley seems to have accepted what had happened with equanimity. "I really don't know what all the fuss was about," he tweeted. "Now, if you don't mind I have some snoozing to do." 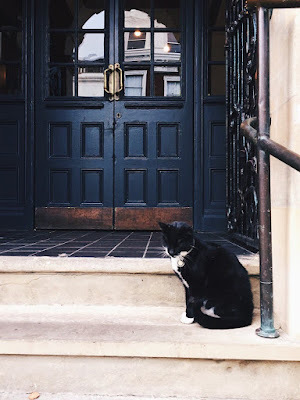 Like so many businesses and institutions, the Bush Theatre likes to have cats on the premises. Regrettably, staffers seem to be only capable of nakedly exploiting them for the many benefits that they so freely bestow upon them without reciprocating by taking any concrete measures designed to ensure their well-being and safety. At the crux of the matter is the theatre's abject failure to assign that awesome responsibility to a specific staffer. Besides providing him with a minder, it needs to confine him to either a room or a particular area whenever that individual is not on the premises and thus unable to look after him. The theatre is sans doute a busy and hectic place with both staffers and patrons alike coming and going at all hours of the day and night. With that being the case, it is doubtful that any of the former devote so much as a moment's thought to Pirate's and Marley's safety. In addition to that all-absorbing concern, a theatre could hardly be considered to be a suitable environment for a cat. Most obviously, with so many loose women parading around in various stages of undress that alone could easily retard the moral development of a young and highly impressionable cat who is just starting out in this wicked old world; a grizzled and world-weary tom, however, would likely already be too far gone to suffer any additional harm. Not to be forgotten, there are the corrupting influences of the infamous casting couch to be taken into consideration as well. In spite of those disadvantages, the keeping of cats is a time-honored theatrical tradition and black ones, such as Pirate and Marley, are especially in demand. "A black cat is preferred; indeed, the mere presence of a black cat is sufficient to insure (sic) the success of any playhouse or any play. However, a cat of another color will do," Carl Van Vechten wrote in his 1922 seminal work, The Tiger in the House. "This superstition is so widespread that every theatre from the Comédie Française (still operating in Paris) to the People's Theatre on the New York Bowery (destroyed by a fire in 1929) entertains a cat, feeding her lavishly, and treating her with a respect and consideration which she seldom receives elsewhere save in the homes of cat-lovers." 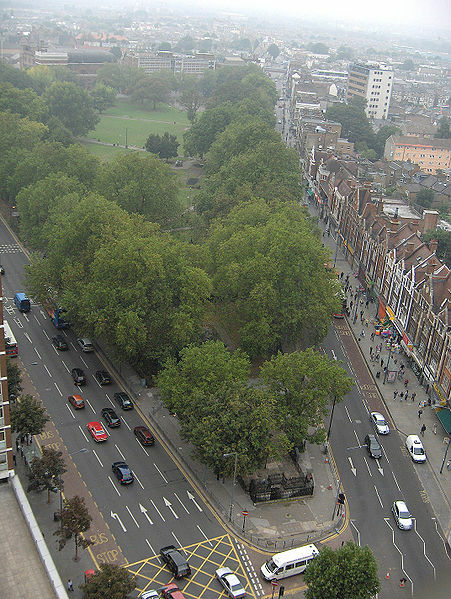 That very well may have been true enough during his lifetime but that was long before cat-killing motorists and serial murderers, such as those now operating in Croydon and Olympia, Washington, took over the highways and byways of London and elsewhere and turned them into their personal hunting grounds. Nowadays, merely housing, feeding, and medicating a cat is no longer sufficient; rather, theatre operators have a solemn moral responsibility to also provide for their personal safety. To put the matter succinctly, it is high time that all thespians stopped living in the past and upgraded their thinking on the proper care of a cat to twenty-first century standards. Despite the assertion of author Margaret Benson that a "cat is above all things, a dramatist," Pirate, like most theatrical cats these days, is not expected to sing and dance for his supper. Although various stratagems, such as releasing mice at opportune moments and laying down trails of chopped meat, have been employed in the past as inducements, most cats do not have the slightest bit of interest in entertaining a house full of strangers. "Now at home he is a natural actor," Van Vechten continues. "But, away from home, or constrained, the cat has a natural timidity, a natural dignity, and a feeling which amounts to an absolute aversion for the performance of silly antics which other animals, such as seals and dogs, seem to enjoy, and which elephants can be taught to execute with facility if not with desire." They accordingly are especially difficult to train but not for the usually prescribed reason. "They are difficult to train, not because they are stupid but because they are too intelligent to be interested in such nonsense. A cat is never vulgar and this sort of thing undoubtedly strikes a cat as vulgar," Van Vechten opined. "It is perhaps easier for a cat to train a man than for a man to train a cat. 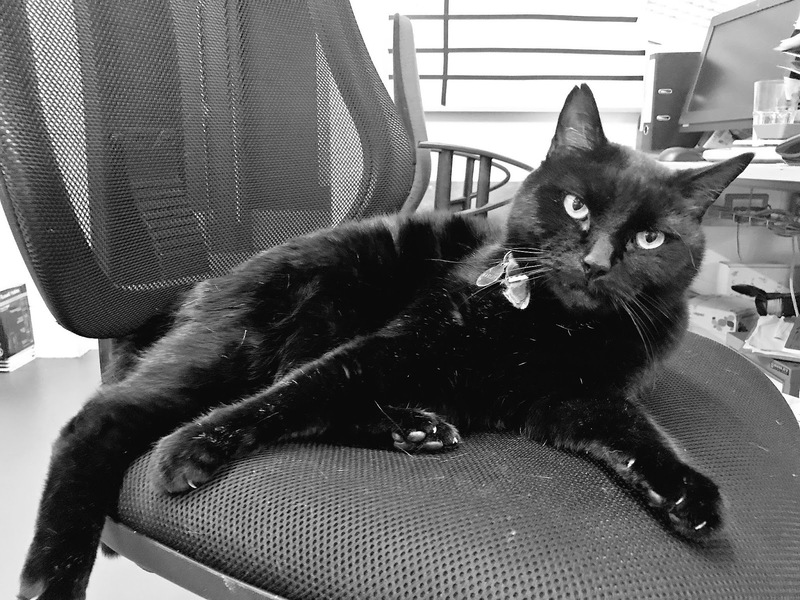 A cat who desires to live with human beings makes it his business to see that the so-called superior race behaves in the proper manner toward him." 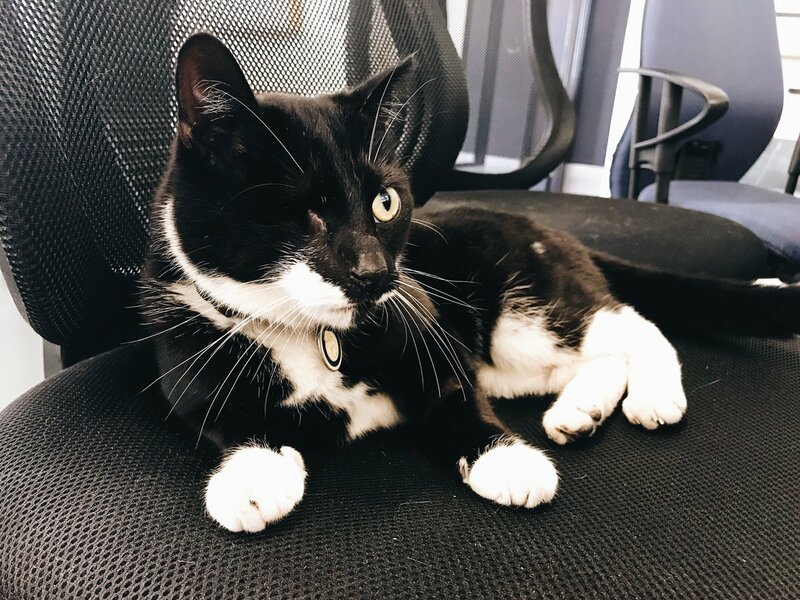 So, in addition to serving as the Bush Theatre's good luck charm, Pirate provides staffers with companionship and helps them to calm the jitters that often accompany performing before a live and demanding audience. 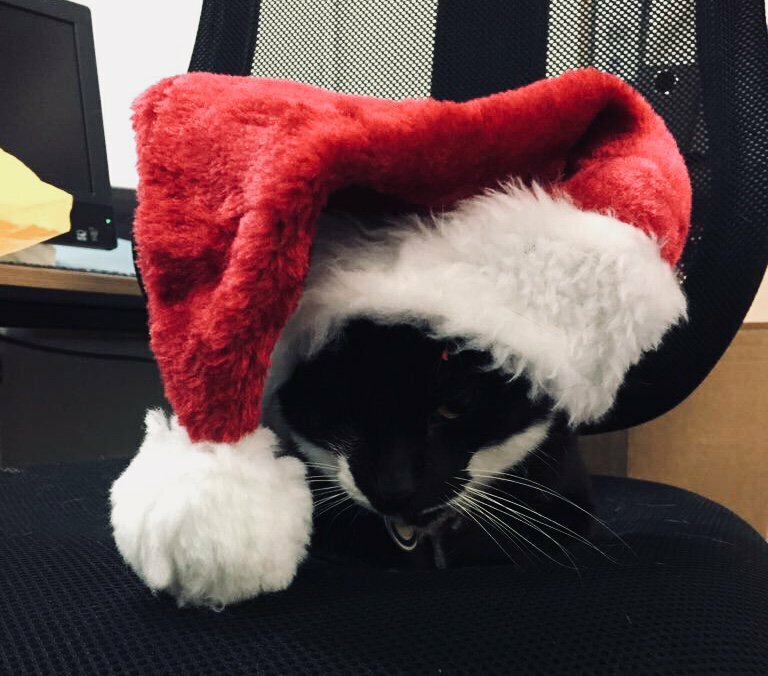 At other times, he enjoys chasing the mice out of computers, playing with his toys, and taking an active part in the theatre's observance of such seasonal festivities as Christmas. Other than that, not a good deal is known about him except that he was acquired from Battesea and has been residing with the thespians for about five years. Somewhere along the way he tragically lost his right eye. He is perhaps best known to the outside world, however, for compassionately opening up both his heart and home last summer to the survivors of the inferno at Grenfell Tower, located a scant two kilometers removed from the theatre. "If your kids need a cuddle Marley, Caramel (the theatre's third resident feline) and I are here," he tweeted on June 14th, the day of the catastrophe. "Thoughts with those affected by the Grenfell Tower fire." In spite of all that Pirate has come to mean to so many people around the world, staffers at the Bush Theatre have on at least two occasions carelessly and inexcusably placed his life in grave jeopardy. Things usually do not work out this way very often in this topsy-turvy world but, thanks to The Fates, they now have been given a third opportunity in order to atone for their past oversights. A necessary first step in that process would be for them to wake up and realize that Pirate's life is not any less precious than any of theirs. Specifically, since he does not have any way of anticipating the myriad of dangers that await him outside the theatre's front door, it is paramount that they, who most assuredly do know, take proactive measures on his behalf in order to safeguard his life. Most importantly of all, that is no less than what he so richly deserves. Since he has grown so accustomed to tragedy, danger, deprivation, and multiple abandonments, it is only fair that he be provided with an opportunity to fully get to know their polar opposites. "You can't save every animal in the world but for the one you do save, it is the world," Greek Animal Rescue Canada in Toronto stated back in 2008. In that regard, there cannot be any question that saving Pirate is a task that is preeminently within the power of the thespians at the Bush Theatre. Photos: Twitter (Pirate and Marley) and HTUK of Wikipedia (an aerial view of Shepherd's Bush).